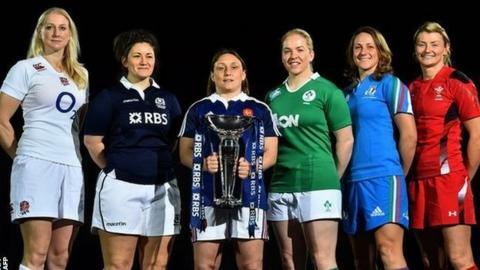 A new era has dawned in women's rugby and the 2015 Six Nations will be its first real test. With some nations prioritising the Rugby Sevens at Rio 2016 and many teams in transition, the outcome has never been more difficult to predict. As newly-crowned world champions, England will be the scalp every nation wants - but having seen the departure of head coach Gary Street less than two weeks before the start of the tournament, these are changing times in the England camp. France are the reigning Grand Slam champions while Ireland, winners in 2013, are also likely to have their say on where the trophy is presented at the end of March. Wales have been least affected by World Cup retirements and the team has the potential to mature during this championship. With England, Ireland and France all running professional or semi-professional sevens programs, the lure of the Olympics could prove a significant distraction. Two of the Six Nations weekends clash with the Women's Sevens Series dates in Brazil and the USA, where teams will be working their way up the standings to qualify for Rio. Captain: Tamara Taylor (lock, Darlington Mowden Park) & Katy Mclean (fly-half, DMP). Six England players have retired since lifting the World Cup last August, seven will be in Brazil at the Women's Sevens World Series, a few more are injured and their coach, Gary Street, left less than two weeks before the first match. Regular captain Katy Mclean will be one of the players in Brazil so club-mate Tamara Taylor will open the championship as England skipper. However, they are still one of the favourites, despite the upheaval, because of the squad depth developed over the last three years and the strong club structure that continues to unearth young English talent. Tamara Taylor: "Gary was my first academy coach at England and he's been with me on my journey. He's been the epitome of women's rugby. It's going to be a big change but there are also massive changes in the squad. At the camp in January it was a matter of making sure you knew everyone's name and what positions they play. "But, there is such good talent and we do play everyone week in week out at our clubs so it's not that we don't know what to expect. We were the dominant force for a few years - I'd really like to get the Six Nations trophy back." France are the reigning Six Nations Grand Slam champions and will still be smarting after being knocked out of their home World Cup in a Paris semi-final. They have a new coaching line up but the likelihood is the team will still be built around their extremely physical and streetwise pack. With eight new caps in the 23-woman squad and three away games (including Ireland and England), retaining their title would be something special. Gaelle Mignot: "After the World Cup we're really looking forward to having all the spectators filling the stadiums again. The new players are bedding in well and it's good to have new faces. "We're the holders of the title, so we're hoping to keep it. We are away against England and Ireland, and they're very tough teams, but we're hoping to do well." Ireland are a mystery package. They knocked the dominant force in women's international rugby, New Zealand's Black Ferns, out of the World Cup, but five months on much has changed. Ireland have lost their taliswoman - prop and captain Fiona Coughlan - to retirement, and they're also under the new stewardship of Tom Tierney following a management shake up as a result of Philip Doyle stepping down after France 2014. They'll be using five players from their Sevens program and have named 12 new caps in a 30-woman squad. There's still a strong core despite the changes and Ireland should be one of the contenders come the end of March. Niamh Briggs: "We've had a lot of change - a whole new management structure and 12 uncapped players. It's all about working to the best of our strengths and starting to gel as quickly as we can as a squad. "I'm no different to any other athlete; if you play, you want to win. I understand it's going to be difficult but we played well against Wales in our warm-up match, but we have a lot of work to do." Wales have been showing youthful promise in recent seasons but have yet to convert that into success on the pitch. However, unlike other sides, they have retained most of their senior players from the World Cup. Wales have unearthed new players from other sports through talent identification programs and keep an eye out for 17-year-old scrum-half Kiera Bevan. Wales have three home games in 2015 and this could finally be the year they break back into the top three of the Six Nations table. Rachel Taylor: "We're lucky we've kept our core group and have the youth coming through. "I think playing England first up benefits us in a bizarre way. I know they are world champions and did fantastically well but with players retiring and new coaching set ups, it makes it quite exciting. It doesn't make it as typical as normal." Scotland continue their re-building process. It has been 10 years since the team featured in the top three in the table, and they haven't avoided the Wooden Spoon since 2010. However, you feel that head coach Jules Maxton is now better supported by the Scottish Rugby Union and although the Scots will not be title contenders, a few more tries and a better defensive record will set them on the right course. Tracy Balmer: "We've proved to ourselves we can score, we just need to prove to everyone else within the Six Nations. It's a good time for us as a squad as we've been together for a couple of seasons now. "Off the back of the World Cup, England and Ireland have had quite a few retirements and new people coming in. I think that puts us in a good place and if there was a time to prove ourselves, this is the Six Nations to do it." A one-point win over Wales guaranteed Italy fourth place in the 2014 Six Nations. Since then, though, Wales have the experience of the World Cup behind them - a tournament Italy failed to qualify for. Andrea Di Giandomenico's squad has had a busy autumn that included a convincing 27-3 November friendly win over Scotland and they are moving in the right direction. Their focus will be to qualify for the next World Cup in 2017 and they are a side that could easily upset the championship's favoured sides. Silvia Gaudino: "Every year it's fantastic to start this adventure. It was very frustrating not being at the World Cup, but we're starting on the right foot this time and with this championship working as qualifying for the next World Cup, we plan to start well."